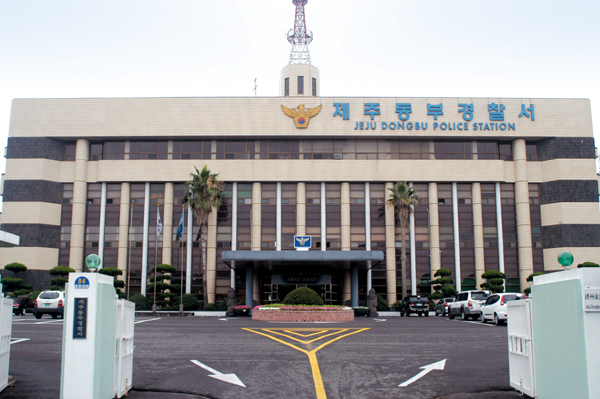 Jeju Dongbu Police Station. Photo courtesy Jeju Special Self-Governing Province. The case, in which the body of 26-year-old female staying at a guesthouse in Jeju was found with signs of being strangled, has shocked Korea and Jeju. Worries were originally raised about the whereabouts of the woman on Feb. 10 by her parents after they hadn't heard from her in a few days. The next day a police search found her body near to the guest house she was staying. The 34-year-old guesthouse manager soon became the prime suspect after he fled Jeju in the time between being questioned and the body being found. This led to a nationwide search for him starting on Feb. 12. According to the results of an autopsy, he appeared to have hanged himself using a stocking. Tape marks around his neck suggested that he originally planned to use tape but found that it was too weak. After leaving Jeju, it seems that he went straight to the motel and he had been staying there since Feb. 12. Police say that on the same day he bought tape and a stocking from the nearest convenience store. At around 8:00 p.m. a woman entered his room for around an hour, leading police to assume that he was using a prostitute. Current estimates suggest that he committed suicide around two days later on Feb. 14. There are currently no other suspects in the case and the police hope to have a clearer picture of what happened after further investigation.